Protect your valuable assets with C.I.M Industries Inc. chemically resistant, cold applied liquid elastomeric membranes of seamless polyurethane with tremendous strength and flexibility for tank linings, potable water containers, seamless roofing, containment liners and water-proof decks and pavements. Expect great service from Laster/Castor and years of protection from quality membrane barriers by C.I.M. Industries Inc.
CIM 1000 is a two-component high performance coating and lining that forms a seamless, tough elastomeric membrane. The cold applied materials are asphalt-extended polyurethanes that combine both the water impermeability characteristics of asphalt with the tough flexibility of a urethane to create a system that will last for years. Materials are UL fire rated and meet tough VOC regulations. 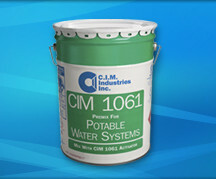 For larger jobs the CIM material can be sold as drums or totes. 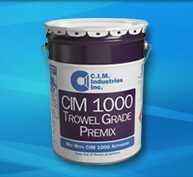 CIM 1000TG (Trowel Grade) is a tough, liquid applied, two component, chemical and corrosion resistant urethane elastomer coating, chemically thickened to allow trowel applications with minimum sag. It can be used as a crack filler or for application to vertical surfaces and corner flashings. CIM 1000TG offers the same advantages as CIM 1000 and is approved for contact with potable water in accordance with ANSI/NSF 61. 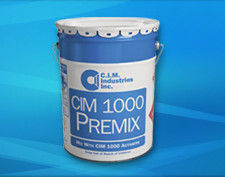 CIM 1000TG may be applied in thicknesses up to 250 mils on vertical surfaces. For larger jobs the CIM material can be sold as drums or totes. Crack Filling, Vertical Surfaces and Corner Flashing. See Product Brochure . . .
CIM 1061 is a two-component high performance coating and lining that forms a seamless, tough elastomeric lining. The material is an asphalt-extended polyurethane that combines both the water impermeability characteristics of asphalt with the tough flexibility of a urethane to create a system that will last for years. Products are UL fire rated, meet tough VOC regulations and are ANSI/NSF 61 approved for potable water contact. For larger jobs the CIM material can be sold as drums or totes. 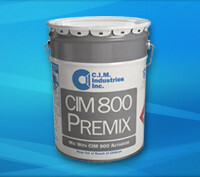 CIM 800 is a tough weather durable, waterproofing coating specifically formulated to meet the demands of waterproofing above or below grade. This two component, cold, liquid applied urethane coating adheres to form a permanent seamless barrier to water. It is especially well suited for roofs over critical spaces (e.g. clean rooms, control rooms), areas with multiple penetrations and curbs, and between-slab waterproofing. For larger jobs the CIM material can be sold as drums or totes. CIM 61TN and CIM EMT PRIMER are two component epoxy primers that are primarily used to limit outgassing or bubbling on porous substrates like concrete. The materials can also be used to hold the blast on prepared metal surfaces. CIM EMT Primer is a solvent free epoxy that is moisture tolerant and can be used to lower water vapor transmission rates on concrete substrates. For larger jobs the CIM material can be sold as drums or totes. CIM Bonding Agent is an organo-silicone compound dispersed in isopropyl alcohol. The bonding agent improves the adhesion of CIM high performance coatings to a variety of surfaces. Specifically it assists in adhesion of CIM coatings to non-porous substrates like metal, glass and tile. It improves the bond when applying a CIM coating to an existing CIM coating after the recoat window has passed, it is necessary to abrade the surface and apply CIM Bonding Agent to the overlapped area. For larger jobs the CIM material can be sold as drums or totes. CIM Scrim is a three ounce stitch bonded polyester material that is used to provide for uniform applications over cracks, details, vertical to horizontal transitions and can also be used as a backing when applied over earthen surfaces. CIM Scrim is Available in these sizes: 6″, 12″, 100″ x 100 Yards 40″ x 108 Yards 10 Ft. x 100 yards. Holding a powerful mixer is tiring; a tired person is prone to mistakes. The CIM Mixing Jig takes the bull-work out of a critical task, letting staff focus on proper mixing; doubling productivity and effectiveness. A proper mixing sequence requires that the mixer start the premix material moving before adding the activator. The mixing jig is designed to allow hands free operation meaning that one person can effectively and thoroughly mix the coating prior to application. Note: not for use with Trowel Grade CIM 1000TG. Successful mixing requires accurate, repeatable mix times. It is critical that CIM high performance coatings and linings are mixed for the proper length of time. 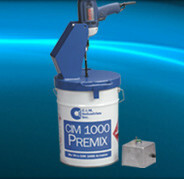 The CIM Mixing Timer ensures accurate and exact mixing times, pail after pail. Pushing the start button on the timer starts the process of getting the premix material moving. The activator is then poured into the rolling premix. Pushing the start button again then ensures an accurate and repeatable mix time. CIM Squeegees are designed to work most effectively on flat, horizontal surfaces. The squeegee efficiently spreads the mixed product to a consistent mil thickness. CIM Squeegees are most often used to apply CIM materials to horizontal surfaces. The squeegee blade is made from durable notched neoprene with a 30″ blade size and nominal size for nominal application rates 20 mil or 60 mil dependant on squeegee selected. Check out our >> CIM Waterproofing Product Selection Guide . . .